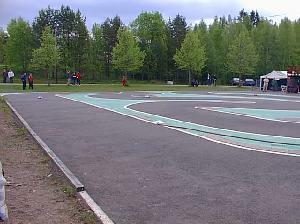 The Finnish FinTrack Summer series started this weekend at the Kuusankoski track in the southeast of Finland. Over 40 drivers were entered in the Touring Modified class, but a few opted to stay at home because of the uncertain weather. 38 drivers showed up to battle in this class in the very competitive touring car scene. As mentioned, the weather looked a bit bad in the beginning. After an overnight rain the track was soaked in the morning and free practice was run in wet conditions. Only a few drivers ventured out onto the wet track since the weather was getting better, and it was looking as though the race would be run in the dry. I went to the track on Friday and arrived there 440km later to get a few practice runs. It took me some time to get a feeling for the track but in the end I was quite happy with the handling of my new MR4TCSpecial. So going into Saturday I was hoping to have a good race. Once the timed practice was underway the track was indeed dry and all drivers got a chance to see what the track was like. Already it was clear that the race would be very close between the top drivers. A new rule for this summer series is that there’s a control tire. The only tires allowed are TakeOff in the SSA, SSB and SSC compounds, and only 8 tires per driver. The tire rule worked well and everybody was running the SSA compound because of the chilly weather. 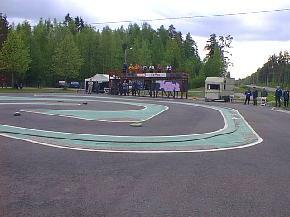 Qualifying was very close but in the end it was Associated/LRP driver Teppo Kauppinen who took TQ in his first race in Finland with his new Associated TC3 FT car. Teppo’s car seemed to the fastest on the straight and it worked very well in the corners as well so it was the dream debut with the TC3 for him. Only .5 seconds behind was Corally driver Simo Ahoniemi with Teemu in third with his Schumacher. that I did not check the motor before I was up on the drivers stand…and then the car went backwards….yup I did the classic thing. So my second round was over before it started. I did then change it and went out to see how the car was working…and I was happy to see that I had now found the speed. So going into the last round the pressure was on…I had to have a good run. It was ok and clean but I lost 3 seconds in the end when I dumped so my final qualifying position was 15th. 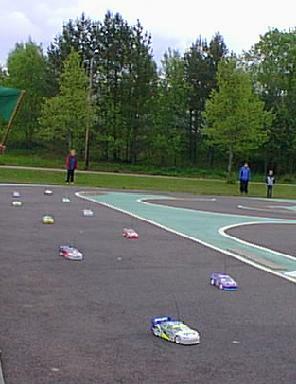 The track stayed dry for the finals so everybody was looking forward to a set of close races. It was Simo Ahoniemi who was the winner of the first very close final with Teppo in second and Sakke Ahoniemi with his Corally in third. Teemu had a DNF in the first main but in the second one he checked out about halfway into the five minutes and never looked back. So it was the Axis that took a comfortable win this time with Teppo again in second. Going into the last race it was anybody’s win. Basically it was the winner of this final that would take the top spot overall. 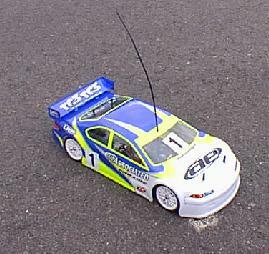 Teppo’s TC3 shot away from pole position convincingly and led the first couple of laps. He then had a coming together with Simo so after that Teemu took the lead with Sakke coming through into second. That was the way the race finished so it was Teemu who once again won overall with Teppo doing enough to finish in second ahead of Simo. I had two good runs in the b-finals, finishing third in the first and second in the second final. That second final was actually my best race ever since it was a close fight from start to finish. In the beginning we were three drivers fighting but after about three minutes we were only two. I really tried to win, but I could not really get close enough. In the last minute I was probably trying a bit too hard and that meant that I dumped in the end and that was it. Anyway I was really happy after a final like that. I finished 12th overall. Next it’s a three week break from racing for most drivers except Teemu, Sakke and Simo who will be racing at the Reedy Race in Ripon next weekend. The rest will surely work hard to try to find even more speed for the next round of the FinTrack series.